The track is off the rapper’s mixtape Drink More Water 5. Just a few days ago, iLoveMakonnen released his all-white winter merchandise: a polo cap, a pullover, and a sweater. Keeping with the holiday spirit, the 26-year-old rapper has dropped something else, a video for "Leave U 4 Myself," a track off his mixtape Drink More Water 5. 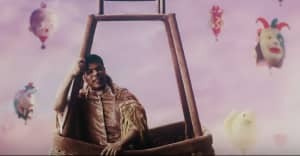 In the video, courtesy of Directed by Max, the Red Dragon (another one of iLoveMakonnen's many stage names) walks around New York City carrying along a freaky mannequin head. It's a pretty melancholic song, but it suits the holidays. You can watch video below. In addition, read our feature on iLoveMakonnen from last year. Eric Eidelstein, Hip-Hop, ILoveMakonnen, Warner Bros.